I recently just got my raspberry model b with sensehat addon. 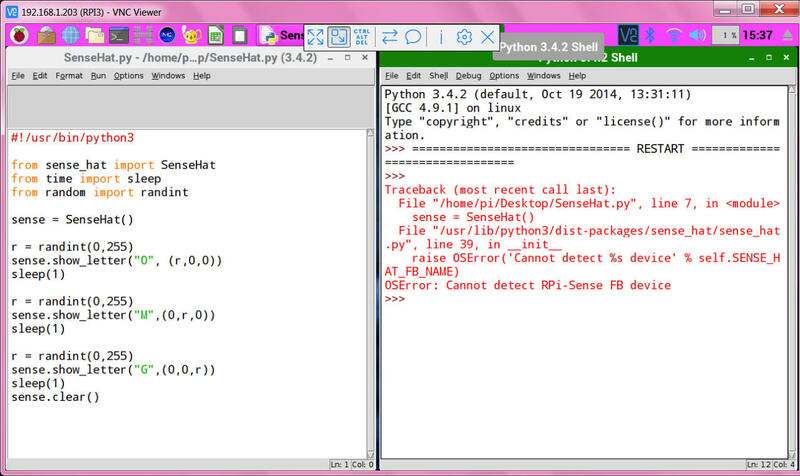 This is my first time using such programming devices as python and I don't get why there is always a syntax error. I'm writing my command in Python 3 (IDLE), run it (working) for one time, save it as a .py file. When I try to run the command again, a pop-up showing invalid syntax appears and I can't run it again. The LED screen of the Sensehat is stuck at that moment and I have to rewrite the whole command to run it again for one time.. Does anybody know why this is happening? If you are running IDLE, then the cursor will be placed in your source file at the point where the error was found. It should also have a highlight at the spot. That should help you at least locate where the compiler is having problems. Is ist possible that you are typing your code into Idle's shell window instead or using an editor window? IDLE3 which is where I assume you are editting and typing if you are following the sites Learn the SenseHAT lessons. You 'edit and run' the program from there. Now there is Thonny too, excellent program for learning on and learning to debug and follow how a program is running. Python 3.4.2 <-- the "4" is highlighted. I'm not sure where I'm trying to run the command. Well I just click on the Python 3 Icon and start writing my command, when I press enter at the end, the commands starts running for one time. Then I'm saving the file on the desktop. Reopening it, you get one more option in the topbar of the file, I can "Run" the file pressing F5. But it won't work. here i used IDLE3 but NO HAT, so the program can not work. 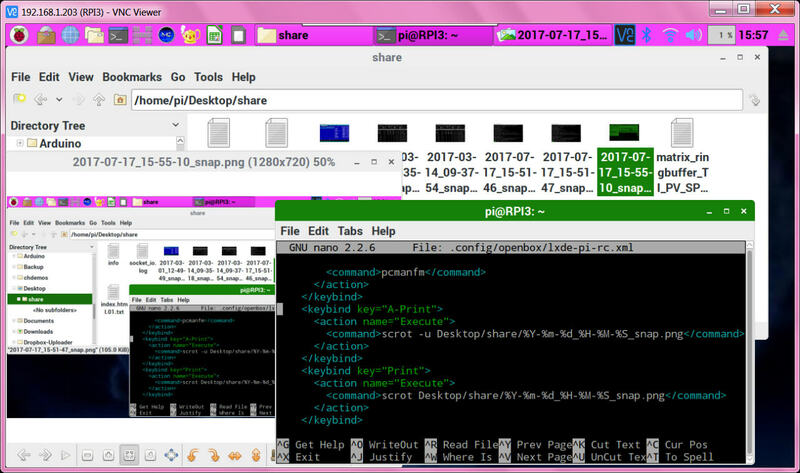 so that is how the IDLE3 file edit window and the IDLE3 shell window can look. here i operate via VNC / screen shot on win7 PC / upload server.. I'm not getting it, so sorry. :/ What do I need to do that it works? 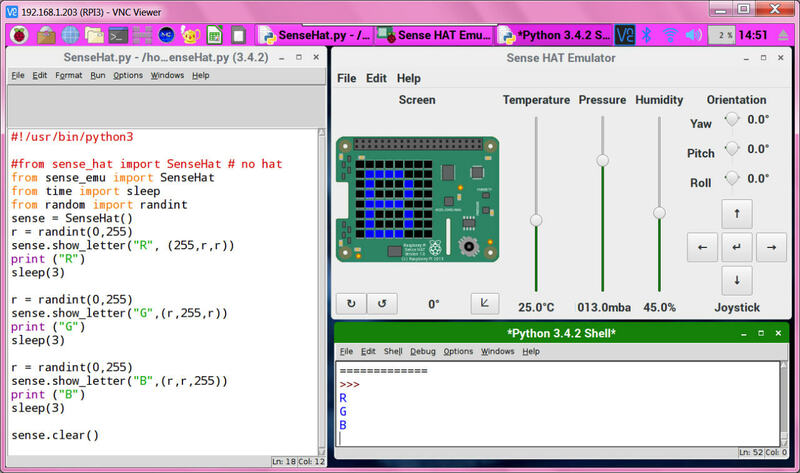 The Pi and SenseHat is fully working. But thank you for your commitment so far!! @gkreidl was most likely correct. When you start up IDLE3, ignore the initial default Python Shell Window. Open a new window via the File/New menu option. Retype your script there, or if you wish edit your existing script to remove all the 'junk' that was added by Idle that you did not originally type. the first 4 lines in your saved file are superfluous. Thanks, I will try that! I'm currently overwriting and redownloading my SD-Card. I'll keep you updated! What editor are you using ? It's hard to make out your screenshot BUT why does it have the bit about python at the top ? It seems to be seeing that as code ? You need to open a new window and type your code in that ? The text at the top is there when I click on the Python 3(IDLE) icon to open a new file. I can not delete that apparently. khse wrote: The text at the top is there when I click on the Python 3(IDLE) icon to open a new file. I can not delete that apparently. Clicking on the Python 3 (IDLE3) entry on the Raspbian desktop menus opens a new instance of the IDLE 3 IDE/Editor. It does NOT open a new file. Please see my reply a couple of hours ago for precise information from the Raspberry Pi Foundation about how to do this correctly. Once opened click on FILE, and then NEW FILE to open a new window, and type in that. Ok perfect, now it works fine. Thank you guys! but thanks for the nice idea!